April 6, 2019 Robert W.
Sandwich board sidewalk signs are a great solution for temporary signage to grab peoples attention as they pass by your business location. These temporary signs are large enough to get the attention of people going by and get results. Sandwich board sidewalk signs can be placed most anywhere as they are very portable and easy to set up, which makes them a favorite among stores and businesses. 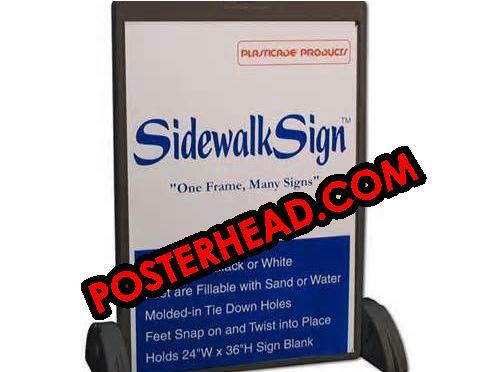 Sandwich board sidewalk signs are cheap in price and easy to change out signage. Many cafes and restaurant prefer these sidewalk signs because they can rotate their signage very easily. One local café runs a special on a certain food for a few days and then changes the special out to another food. Since the sandwich board sidewalk signs allow for easy change out, employees can change the signs out in less than a minute, save the old signs for a later rotation. The employees can have a lunch special on the sidewalk sign and then change the sign to include marketing for a dinner special. The signs are placed on or near the sidewalk where they can receive maximum exposure for people passing by. Sandwich board sidewalk signs are cheap in price, a deluxe sidewalk sign is around $120.00 with two inserts. These inserts can be full color ( you can have as many colors on them as you want ) hold a 24″ wide by 36″ tall sign on both sides and can have pictures of food or other pictures printed on them as well. During windy times, the sidewalk signs can be filled with water or sand to add weight to the sign so as to prevent being tipped over or blown away by the winds. Best of all, the signs are waterproof as they are made with a hard, durable plastic that can withstand the weather elements.